The Magnetic Base is used where the air operated product is required to be fixed but can also be frequently moved around. The extra strong Magnet allows for flexible Mounting, whether vertical or horizontal. Optional mini shut-off valve can be supplied. There are two sizes – a large and small base. The large magnetic base is supplied as a standard with the Adjustable Spot Cooling System while the small magnetic base is supplied as standard with the Mini Cooler System. The units have a swivel system to orient one connection to either side or the top while the second connection is at one end. A lock ring locks the swivel into place. Apart from their use with the adjustable spot cooler and mini cooler systems, they are purchased separately to be used with many other blow off products. 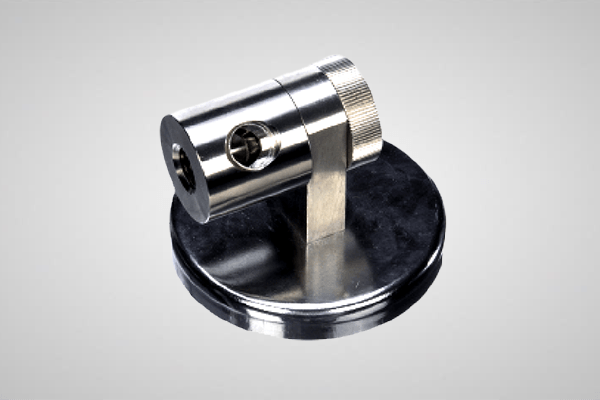 They can be easily connected to the Rigid-Flex Hoses which in turn can be utilized with air nozzles, and act as a secure base for a convenient blow off system that is also portable.